Last Sunday Doggie boy went for his first riding lesson. He had been riding with trainer wheels for quite awhile and it was his first time riding without them attached to the bike. He has been watching his elder brother Monkey boy ride his bike without trainer wheels and couldn’t wait to upgrade to a normal bike for a while. He was really excited when we told him that Singapore Bike School had offered to sponsor him bike lessons and he will be taught how to ride a bike properly. Doggie boy getting ready to start. After being introduced to instructor K, Doggie boy was given a helmet to wear. He was also given a height appropriate bike without wheels. Balance is very important in learning how to write a bike. If one is unable to balance on the bike there will be a higher chance that he may fall off or lose control of the bike if it was going to fast or round the bend. Doggie boy was taught how to remain seated on the bike when it was in motion and turn properly by leaning to the right or left depending on which direction he was going. Once he could balance the bike , move a distance and turn left and right with it it was time to move on to Lesson 2. Learning where to put his feet before starting off. The pedals of the bike were placed back before this lesson started. Doggie boy learned how to positing both feet before he starts of cycling. He had to put his dominant feet on the pedal and use both feet to kick off. Coming to a stop he had to gently squeezing the brakes. If he were to suddenly squeeze on the brake there will be a high chance that he may get thrown off the bicycle when it suddenly jerks. The instructor commented that most of the time kids use their feet to brake when they want to stop. They are not used to using the brakes and have to be constantly reminded. I agreed as they feel almost by instinct to use their feet instead of the brake. Now that Doggie boy could handle the bicycle quite confidently he was given the task of trying to ride through the obstacle course set by the instructor. I manage to take a video of him riding the bicycle. Doggie boy attempting to ride on the road. Before long he was riding on the road within the road safety park. He wasn’t that stable and kept bumping into the curb. I guess it will take a while for him to be more seasoned with riding a bicycle. It was a great achievement to go learn how to ride a bicycle within 1 lesson and we were extremely proud of him. Now is the time to get him a new bicycle. Disclaimer: We were offered two consecutive free lessons from Singapore Bike School however we only managed to have one as the instructor is away for the month of March and we are only free on weekends. What are you reflecting on this week? Join in our linky and link up below. It seems he really learned so much just from one lesson. I miss biking and hopefully my children could learn how to bike, too. It’s great for fitness. I miss biking. I am not so good in biking but boyfie taught me how and now I forgot how to o it again. hahaha.. I should really be teaching my boy, too. I love biking. Haha…No baby in the pram.. it belongs to Tiger girl and she was off walking on the beach with her dad. 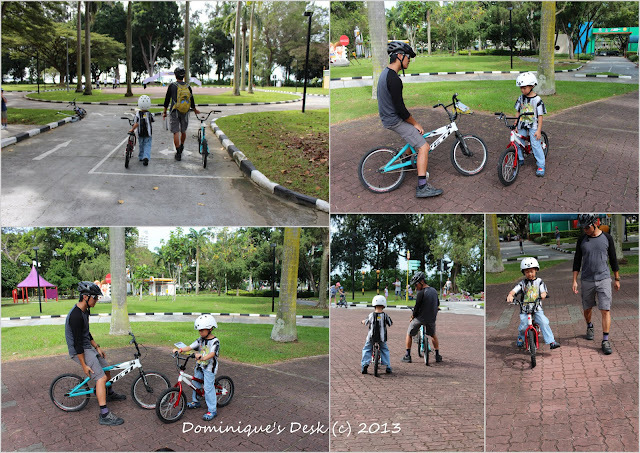 The class was held at Road Safety Park at East Coast Park..you will have to contact Singapore Bike School for more details of their upcoming classes. Wow, he looks like he has become quite the pro already!